Charles A. McGeorge joined MMA as its tenth president in 2012. 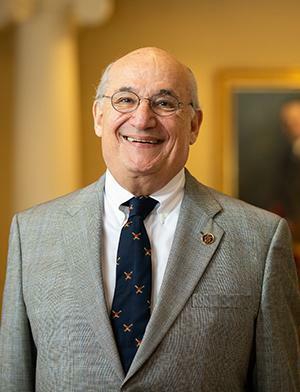 He was named president emeritus in February 2019. President McGeorge's academic background includes a B.A. in Sino-Soviet History from Boston University and an M.S. in the Dynamics of Organizations from the University of Pennsylvania. President McGeorge holds a certificate in Advanced Management from Northwestern University’s Kellogg School of Business. He brings distinguished professional experience in the business, non-profit and academic sectors to MMA. Prior to his appointment as MMA president, he was the principal of McGeorge & Company LLC, which provides consulting services to independent schools and colleges in the areas of marketing, strategic planning, organizational dynamics and board relations. He is also the founder and current president of Mustang Scholars’ Foundation, Inc., which provides college scholarships to underprivileged young men and women of promise, character, and intelligence. President Emeritus McGeorge is a former president of Valley Forge Military Academy and College in Wayne, Pennsylvania, and was a member of the Board of Trustees for the Valley Forge Military Academy Foundation. He later served as Counsel to the Office of the President, overseeing enrollment management, marketing, and public relations. Mr. McGeorge is a former president of the Association of Military Colleges and Schools of the United States (AMCSUS). Charles McGeorge began his business career at Johnson & Johnson and during his tenure there he helped found two operating companies: McNeil Consumer Products Company (Tylenol) and Johnson & Johnson Health Management, Inc. He was selected as one of the national spokespersons for Johnson & Johnson during the Tylenol poisoning crisis that made business history and became a Harvard Business School case study. Mr. McGeorge taught at St. Joseph's University in the Graduate School of Business and was selected to create their Capstone for the Pharmaceutical MBA. He also taught Strategic Management and Organizational Theory at Eastern University’s Graduate School of Business and was a Guest Lecturer at Immaculata University, University of the Sciences Philadelphia and Ursinus College. A poet and a former member of the Board of Directors of the Iris N. Spencer Poetry awards at Westchester University Poetry Center, Mr. McGeorge is a recipient of the McKesson Foundation’s Neil Harlan Award and a Ronald Reagan Gold Medal recipient. He has also been named PECO’s “Hometown Hero” and an Honorary Chairman for the Business Advisory Council.